The movie Hidden Figures was inspiring, and I'm happy to be able to share the story of these impressive mathematicians with a younger audience. This picture book gives young readers a clear understanding of these women's contributions, within the framework of the time period. Striking illustrations and brief, compelling text make this a terrific choice to read aloud. 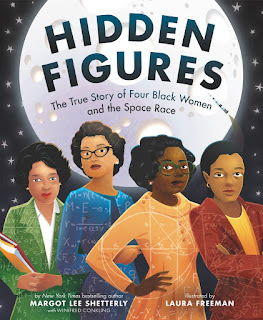 Based on the popular book and movie, this picture book recounts the true story of four black women who helped NASA launch men into space using their mathematical analysis, persistence and hard work. 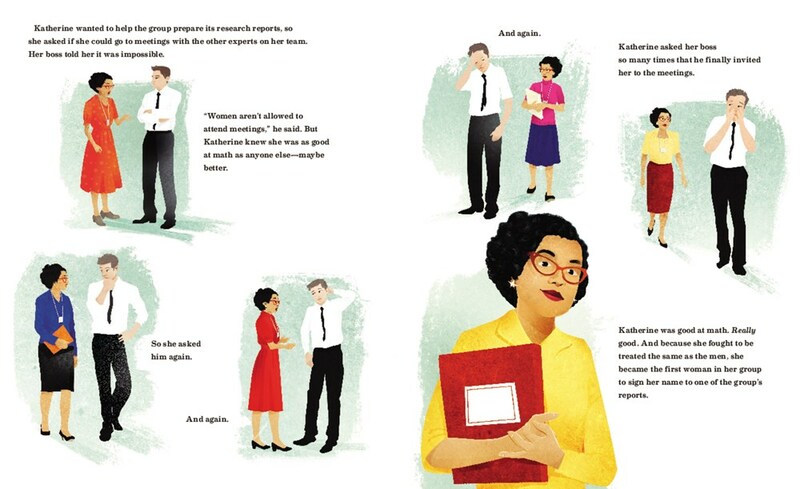 Dorothy Vaughan, Mary Jackson, Katherine Johnson, and Christine Darden used their mathematical skills to help NASA send astronauts into space. And they did so during a time when there were great prejudices against women and African Americans. 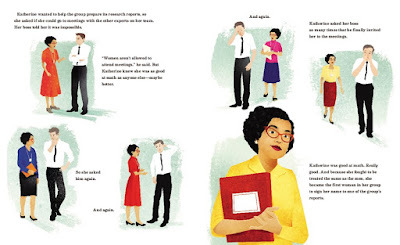 "Dorothy Vaughan, Mary Jackson, Katherine Johnson, and Christine Darden were good at math…really good." 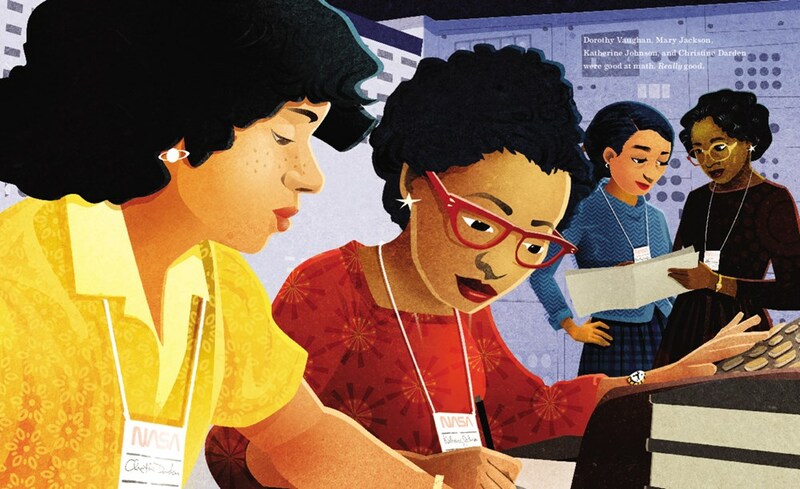 Margot Lee Shetterly, the author who wrote the original book Hidden Figures, collaborated with Winifred Conkling to write an accessible, focused text. They bring young readers through the main achievements of these women, focusing on how they used their mathematical skills to solve important problems. "Katherine wanted to help the group prepare its research reports, so she asked if she could go to meetings with the other experts on her team. Her boss told her it was impossible." Laura Freeman's illustrations draw readers into the scene using bold colors and focusing on the women's experiences. The illustrated timeline in the back is especially engaging and helpful for young readers. A "Meet the Computers" provides more information on each of the four women featured, allowing students a way into learning more. 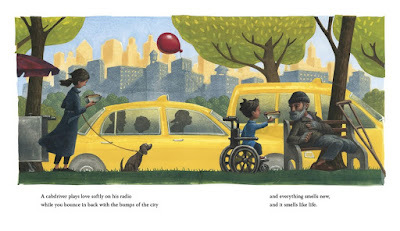 This picture book goes beyond just being a tie-in with the movie. Seek it out to share with young children who are interested in inspiring figures, but not ready for the whole movie. Illustrations copyright ©2018 Laura Freeman, shared by permission of the publisher. The review copy was kindly sent by the publisher, HarperCollins. If you make a purchase using the Amazon links on this site, a small portion goes to Great Kid Books. Thank you for your support. As our country's political stage has been overtaken with denigrating remarks and racial strife, our children are listening and watching. How can we help inspire them to raise their voices to make our country a better place? We must focus on the great possibilities ahead of us, and we must inspire our children to stand up when they see injustice. 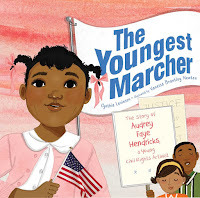 Let the Children March is a powerful new picture book that brings readers into the 1963 Children's Crusade through the strong voice of a young girl volunteering for the march. This is historical fiction at its best, combining well researched facts with emotional details that place readers of today in the moment. "The weight of the world rested on our parents' shoulders, but this burden, this time, did not have to be theirs to bear." 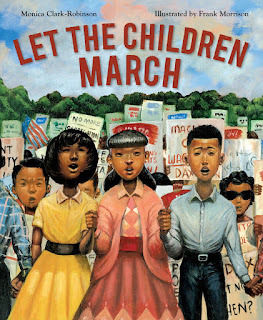 Morrison's dynamic illustrations show the courage, determination and resolve in each of the young marchers. As Kirkus Reviews writes, "Morrison’s powerful use of perspective makes his beautiful oil paintings even more dynamic and conveys the intensity of the situations depicted, including the children’s being arrested, hosed, and jailed." 'I don't have a boss to fear,' my brother said, 'or a job to loose.' 'We can march this time. We'll be Dr. King's army,' I said. 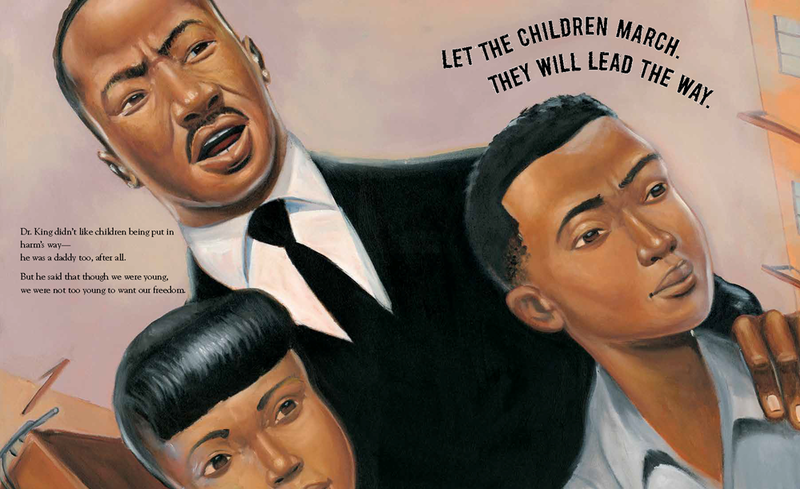 Dr. King didn't like children being put in harm's way--he was a daddy too, after all. But he said that though we were young, we were not too young to want our freedom." 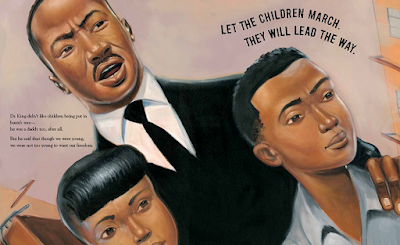 This powerful picture book will spark important conversations between children and adults about the importance of speaking up, the risks involved and the powerful change that can result in peaceful protest. We see the young protestors facing snarling dogs, angry onlookers and water hoses, but we also see the impact that they have on the nation. Pair this story with the picture book biography The Youngest Marcher, by Cynthia Levinson, which tells the true story of Audrey Faye Hendricks, the youngest participant in the 1963 Birmingham Children’s March. Illustrations copyright ©2018 Frank Morrison, shared by permission of the publisher. The review copy was kindly sent by the publisher, Houghton Mifflin Harcourt. If you make a purchase using the Amazon links on this site, a small portion goes to Great Kid Books. Thank you for your support. 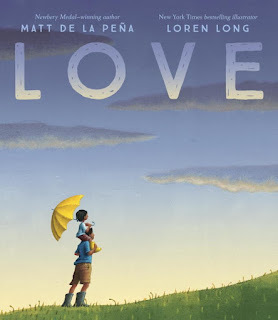 With a poet's eye and a painter's touch, Matt de la Peña and Loren Long have created a picture book that helps us see love in unexpected, everyday moments. With small moments from a diverse cast of characters' lives, this evocative book provides opportunities for us all to think about the intangible feeling of love and learn to recognize it in ourselves. What is love? Where do we see and feel it? Is it in our parents' voices? Or also in the sounds of the city? Is it in a gift outstretched to a stranger? Or maybe in that brief moment just before sunset? With lyrical text, de la Peña brings readers from scene to scene, glimpsing love in many different forms, giving weight and color and texture to this abstract idea. Long takes these brief moments and depicts them, not with one character arc but by showing how people from all over find small moments of love in their lives. This means that children from cities, small towns and rural communities will see themselves reflected in these pages. 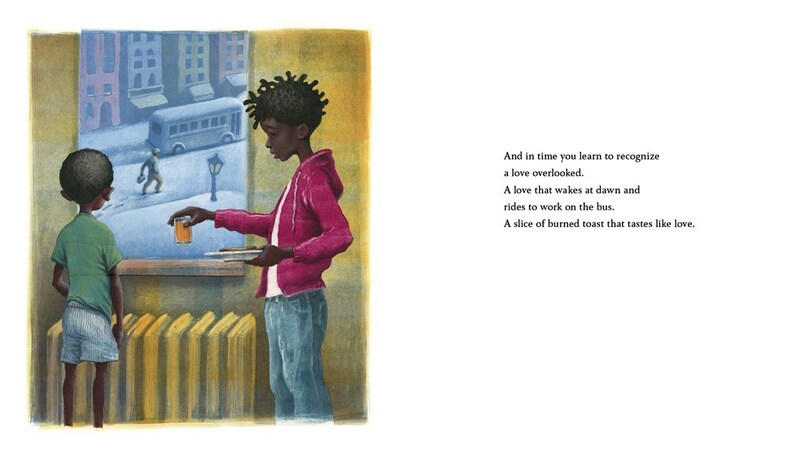 Take a moment to look at this scene to see how Long expands upon de la Peña's text to show a child creating and expanding a moment of love by giving a hot dog to a stranger. This small act of kindness is a moment of love that a child can play an active part in creating. I think this book will resonate most with children in elementary school, especially in 3rd and 4th grade. They have the life experiences to understand how love can exist in painful family arguments or frightening tragedies. 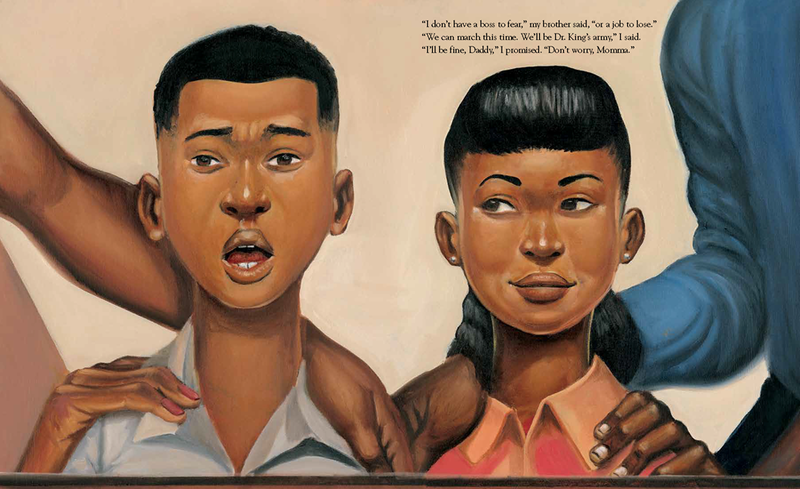 Older children can see how the author and illustrators chose unexpected moments to find love, and what it means to "learn to recognize a love overlooked." "And in time you learn to recognize a love overlooked. A love that wakes at dawn and rides to work on the bus. A slice of burned toast that tastes like love." How do we help our children develop the resilience to push through difficult times? Certainly, recognizing small moments of love helps us all be stronger in our journeys. Even more so, seeing the love within ourselves, and within the world around us fortifies us. As we begin the new year, people ask each other what resolutions they've made. Sure, I'd like to exercise more. But really, I want to hold hope in my heart. That sense of hope, of deep-rooted optimism is essential to children's books. Katherine Applegate, winner of the Newbery Award for The One and Only Ivan, captures this essence of hope in her newest book Wishtree. A wise old oak tree, Red, narrates this heartfelt story of friendship and community. voice, humor and perspective. Our students have really responded to the fact that the tree tells this story. It's something they don't expect, and Red's humor wins them over. For years now, Red has been the neighborhood wishtree. Every spring, people tie bits of paper, fabric or yarn to Red's branches. "Each offering represents a dream, a desire, a longing." (11) These wishes, these little bits of hope, make Red especially attuned to people's emotions. "People tell trees all kinds of things. They know we’ll listen. It’s not like we have a choice. Besides, the more you listen, the more you learn. (13)"
Students at Rosa Parks School especially noticed how the animals depend on Red, and how the people do too. Yulissa and Lol-Be talked about how this reminded them of the Lorax: "I speak for the trees, for the trees have no tongues." Red must take a risk, not only speaking for the trees but also speaking for friendship. They could connect to the difficult situation of speaking up and taking a risk. Applegate skillfully weaves three stories into this brief narrative. A new family moves into the neighborhood, and their daughter Samar notices how special Red is. When an unkind act threatens the balance of the community, Red is truly hurt. Furthermore, the owner of the land Red stands on threatens to chop the old tree down. Interwoven into these modern-day stories is the backstory of Maeve, a young Irish immigrant who brought the tradition of the wishing tree from Ireland to her new home in America. When Red sees the pain and longing in a young girl's wish, he decides to take action. Students at John Muir School really liked how Red wasn't supposed to talk to people but then just blurts out all of a sudden. I also notice how well Applegate develops Red's character, helping readers connect with the tree's perspective. Applegate develops her theme of hope and community throughout the novel, but she does so gently and authentically. As Sharon McKellar noted in the blog Heavy Medal, Wishtree feels "subtle and strong," not didactic or heavy. Moreover, Applegate does this with utmost respect for the child reader, bringing the story directly to them in short, accessible chapters. She's trimmed away extra elements to just focus on this small story, this moment, these characters. And yet her language is funny, wise and lyrical in turns. Some children have noticed that it is very short (211 pages) and reads quickly. One student said, "I liked the storyline but I rushed through it because it was below my reading level." I wonder if the key word there is "rushed." 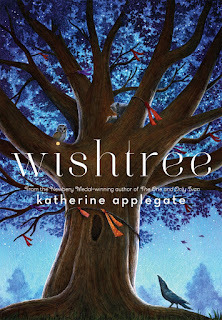 I recently reread Wishtree and the language, the humor and especially the themes stood out to me as distinguished. Wishtree is one of the selections for Berkeley's Mock Newbery Book Club; I am excited to keep hearing what children throughout our schools are saying about this book. The review copy was kindly sent by the publisher, Macmillan. If you make a purchase using the Amazon links on this site, a small portion goes to Great Kid Books. Thank you for your support.